Gov. Gretchen Whitmer’s administration is proposing a tax hike on some Michigan companies to offset a tax break for some seniors on retirement income — in essence, reversing some of the tax policy signed into law by her Republican predecessor, Rick Snyder, in 2011. The new Democratic administration has said the change could bring businesses federal tax relief to counteract higher state taxes, though that’s far from certain. Bridge Magazine breaks down the policy points fueling the debate in Lansing over business taxes. Whitmer’s proposal has drawn pushback from state business groups and Republicans who control the state House and Senate. Business and GOP leaders say the plan would harm the state’s economic competitiveness, while advocates say it would create a fairer tax system by helping residents who were asked to bear a larger financial burden eight years ago. Next to a proposed 45-cent gas tax increase to fix the state’s roads, Whitmer’s business tax plan could be one of the toughest lifts in her first proposed state budget. The state would levy a new 6 percent income tax on businesses that organize as partnerships, limited liability companies and S corporations. They’re commonly referred to as “pass-through entities” because their owners report their business income on their personal income tax returns. Currently, the companies’ owners pay the state’s individual income tax rate of 4.25 percent on their share of business income. The new 6 percent rate would match Michigan’s 6 percent corporate income tax levied on C corporations, which often are larger than pass-through businesses. The tax change would affect nearly 250,000 companies organized as partnerships and S corporations that currently pay the 4.25 personal income tax rate on their business income, according to the Michigan Department of Treasury, citing IRS data. By comparison, the number of C corporations that filed tax returns in Michigan in 2017 was just over 50,000. The administration said pass-through business owners could reduce their state tax liability through a state tax credit claimed on their personal income tax returns that is worth 4.25 percent of the business income that was taxed. That effectively means these businesses would pay a state tax increase of 1.75 percent, rather than the full 6 percent, and would also prevent double taxation of their business income. All pass-through companies also would be able to deduct the first $50,000 of business income from the new state tax, which the administration said also could exclude some of the smallest businesses from paying the higher tax. The pass-through tax increase is estimated to raise roughly $203 million in total revenue in the 2020 fiscal year that starts Oct. 1, and $280 million in 2021. That revenue is expected to partially offset the revenue lost by unwinding the Snyder-era retirement tax, which is estimated to cost the state close to $355 million in 2021. Using those estimates, that would mean the state’s general fund would take in $75 million less than under current tax policy. Whitmer said the business tax is intended to pay for repealing the retirement tax, a promise she made to voters during her campaign. Republican legislators have introduced their own bills to reverse the tax on retirement income, though without identifying a way to recover the lost revenue. 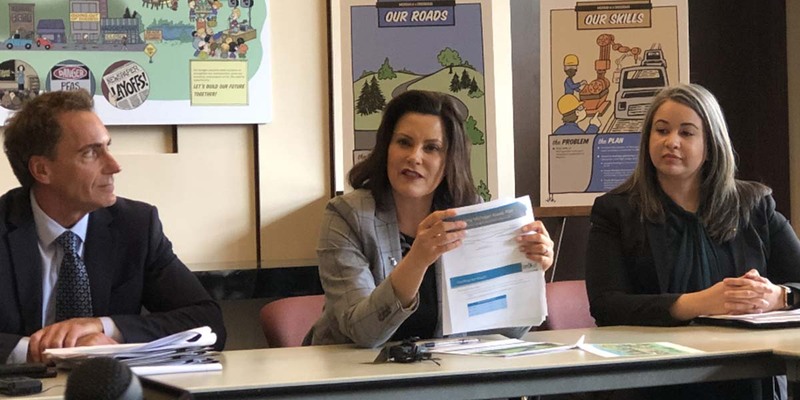 “There’s no question, they’ve got to be able to pay for it,” Whitmer told reporters during a roundtable following her budget rollout this month. She added that the Snyder administration originally attached the retirement tax to business tax cuts in 2011, a move she opposed as a state senator, and that restoring retirement income tax exemptions would relieve some financial pressure on taxpayers from her proposal to raise the gas tax by 45 cents a gallon over a year. The administration’s proposal would begin to restore balance to the state’s tax structure, which leaned heavily on individual taxpayers eight years ago, said Rachel Richards, legislative coordinator for the Michigan League for Public Policy, which advocates for policies to support vulnerable residents. “We’ve at least started opening the door to a conversation on the adequacy of Michigan’s revenues, as well as taking a look at who’s paying them and whether we are all paying ... our fair share,” Richards said. How is Whitmer pitching this tax hike? Rachael Eubanks, the state treasurer, has called the proposal “business tax parity” for leveling the tax rates different businesses pay. She also says it should bring pass-through companies federal tax benefits that could offset much of what they pay in higher state taxes. Eubanks and Jeff Guilfoyle, Michigan’s chief deputy treasurer, told Bridge that shifting the state tax paid on pass-through business income from the owner to the business itself would mean the owners would have a better chance at avoiding hitting a new $10,000 federal cap on state and local tax deductions. That’s because, in theory, they would be able to deduct more of their state and local taxes on their federal returns that might have otherwise exceeded the $10,000 limit, Eubanks said. “It allows these entities to be able to deduct more of their income on the federal tax level, which provides them a greater federal tax benefit,” she told Bridge this month. The concept first has to get by the Internal Revenue Service, which has signaled it may try to challenge such efforts by states looking to work around the new $10,000 state and local tax deduction limits adopted in 2017 as part of broader federal tax reform. Eubanks said the net tax increase to about 250,000 pass-through businesses and their owners in Michigan would be about $105 million, after accounting for federal tax benefits worth an estimated $175 million. The amount an individual company’s business taxes would increase would depend on its annual income. It’s not entirely clear how much of pass-through business owners’ state taxable income comes from their business, since it’s included in owners’ personal income tax returns, which are themselves based on federal adjusted gross income, according to Treasury. The Treasury Department estimated these business owners paid as much as $750 million in state income tax from pass-through companies for 2016, based on Michigan’s 4.25 percent individual income tax rate. Would Washington be OK with allowing state taxpayers to pay less in federal taxes? More than one Michigan tax attorney told Bridge that the federal government may see proposals like Michigan’s as a workaround of the IRS’ state and local tax deduction cap and require that pass-through business income tax credited on a state personal income tax return is counted toward the $10,000 personal limit. The new cap affected high-tax states like New York and Connecticut hardest, said Michael Indenbaum, a partner at Honigman LLP in Detroit. Those two states, in particular, have tried different ways to get around the limits, including creating new charitable contributions that could be written off. Connecticut also tried a similar pass-through entity business tax and credit on owners’ personal income tax returns, which may be the target of new IRS regulations. “This sort of proposal that the governor has is going to fall square within what the IRS is going to attack,” Indenbaum said. The IRS’s guidance in the Connecticut case will be relevant to Michigan, said Greg Nowak, a principal and state tax services leader with Miller Canfield in Detroit. Instead of using a state personal income tax credit, the state could allow pass-through business owners to deduct their business income from their personal taxable income for state tax purposes, Nowak said. That could improve Michigan’s chances of defending the pass-through tax with the IRS. Treasury spokesman Ron Leix said an exemption would be an alternative to a credit, but also more complicated to administer. If the IRS comes down against Connecticut’s pass-through tax structure, which is similar to Michigan’s proposal, the Whitmer administration’s proposed tax rate hike on Michigan businesses would simply lead to higher business taxes without any federal relief, attorneys said. That’s a nonstarter for the state’s business groups. “The new small business tax is not negotiable from our perspective,” said Charlie Owens, state director of the National Federation of Independent Business in Michigan, which advocates for small businesses. Last year, the Legislature passed a bill that would have created an optional, rather than mandatory, pass-through tax, only it would have kept the business tax rate at 4.25 percent. The Michigan Chamber of Commerce supported the bill at the time, said Dan Papineau, the chamber’s director of tax policy and regulatory affairs, saying it could have helped small and medium-sized businesses without costing the state tax revenue. The chamber opposes Whitmer’s proposal. If every state tried a SALT deduction workaround, “the feds would lose billions of dollars,” Papineau said. State Treasury administrators tell Bridge they believe the proposal will hold up against IRS scrutiny. Businesses benefited from Snyder tax reforms. Would Republicans and business groups agree to scale them back? Business taxation in Michigan has been a controversial subject since Snyder signed legislation in 2011 that repealed the state’s complicated and unpopular Michigan Business Tax. Snyder and legislators replaced it with a 6 percent corporate income tax levied on the larger C corporations. The move cut business taxes received by the state by more than $1 billion, which Snyder made up in part by increasing taxes on some retirement income. Business groups hailed the 2011 tax changes for their simplicity. The changes also ended the practice of double-taxing income of pass-through companies, on both the Michigan Business Tax and on their owners’ personal income tax returns. “The assumption that we made back in 2011 was that Michigan needed jobs more than any other thing,” Brian Calley, president of the Small Business Association of Michigan and lieutenant governor under Snyder, said of the impetus for the business tax overhaul after the Great Recession. Calley, a Republican from Ionia County, cast the tie-breaking vote in 2011 to pass the tax changes as president of the Senate. But the 2011 overhaul didn’t sit well with Democrats — including Whitmer. They blasted the tax shift as asking seniors to bear a bigger tax burden so that businesses could lower theirs during the state’s economic recovery. The corporate income tax itself is expected to generate more than $1 billion in state revenue this fiscal year, according to state revenue estimates from January. But the state only gets to pocket about $474 million, with the rest committed to tax credits to companies under the old business tax, an obligation worth billions of dollars that won’t expire until at least 2030. Whitmer told Crain’s Detroit Business in an interview after unveiling her budget this month that she would be willing to trade the business tax increase in exchange for business leaders’ support in raising the gas tax 45 cents a gallon over a year to pay for road repairs. Some business groups, from the Michigan Chamber of Commerce to the Detroit Regional Chamber, have said they’re supportive of raising user fees to fix roads. Brown added that it’s “the first step in the budget negotiation process.” Whitmer has called on the Republican-majority Legislature to adopt the state’s 2020 budget before breaking for the summer. A perfect illustration of the tax mentality of too many lefty Michiganders , "Lets raise taxes!".... On some one else! If a plumber operates a s a sole proprietor he's taxed as regular income 4.25% , if he sets up as a LLC, Whitmer wants him taxed at 6%! All so she can give her gov't worker supporters tax free income! If it's not fair, (it isn't,not that she cares), let's lower the C - corp tax to the 4.25%! Why should we tax one entity more than we tax another? Especially ones that don't vote. ... unless you want to extend the vote to LLCs, S, and C corps? You seem not to understand, LLCs and S Corps don't avoid taxes. Their owners pay the same state and federal income taxes just like you(?). These are not gimmicks they didn't avoid federal or state income taxes. Whitmer and the left just wants them to pay even more! Speaking of wealthy, the single highest wealth demographic group is ... Retirees! If you want businesses to pay a special business entity tax (I don't) then why shouldn't each entity get a vote? Remember the no taxation without representation thing? You may have hit on something there, Matt. Maybe we should give the vote of business owners more weight in matters that affect them. Seriously, lets remember that without businesses there would be no jobs. Without jobs there would be no personal income to tax. And without personal and business income to tax, there would be no government! And, there is nothing you can do to keep businesses in Michigan (or in the U.S. for that matter) if the business climate is unfriendly! Many of us remember when Snyder cut business taxes in his first term. No analysis was one (serious ones) and there was a clear effort to make it very difficult to verify the claims that the tax cuts would 'pay for themselves'. They didn't and we created a hole in our budget that made it impossible for us to do anything serious to repair our failing roads and infrastructure. Whitmer is trying to get us back to a level playing field where the middle class doesn't pay for what business got as a huge bonus. We gave away money we needed, claimed it would re-appear somewhere else and then we ended up with a hole. She's backfilling it now. Apparently, you were fine with giving away money to businesses so they could put it in the owners pocket and not really create anything. Did you complain when Snyder threw away the money. I think not. So given the employment situation, how do you know they didn't pay for themselves? Most businesses complain they can't find employees! That's a lot better than what we saw 2000 - 2010. In that same time I'd suspect we've seen other costs jumping up- how much did we give Detroit and send to Flint? Higher Medicaid costs. Employee Pensions, these have eaten a pile of cash that could have gone elsewhere. The Single Business Tax and the "Personal Property " taxes were some of the worst business hostile taxes ever conceived of, good riddance. Clearly Rick you have never been in business. I own one of very few small businesses that "survived" the recession, but lost all my employees for lack of work. I assure you that I did not, nor do I believe other business owners, took their fortune and ran. While most kept their jobs working for government and other businesses, we in small business struggled from day to day to survive at all. I survived, but I'm still working and recovering while others my age are enjoying their retirements and pensions. Many did not survive. You need only to slow down and notice how many empty storefronts you drive by every day. Each one of those represents somebody's dream that was lost. Those dreams are what makes this country great . . . the promise of unlimited opportunity if you are willing to work hard and once in a while take a risk. If we destroy those opportunities and take away the incentives that drive those motives, we destroy Michigan and America. Just as important is that people have disposable money to spend. Without demand, there is no business. Every politician's answer to revenue shortfall is to raise taxes. I can't remember the last time a pork barrel initiative was scrapped, administrative over head reduced (as in schools and government) or common sense used in funding these projects. The general fund is at the same level it was 20 years ago. It hasn't come close to keeping up with inflation. It is absurd to keep asking the question "how do we make up for the lost revenue?". Instead of looking for more revenue, why aren't our legislators looking for more SPENDING CUTS. Smaller government requires less tax dollars to operate...this should be our goal. Every person/program/building that is paid by the state government is funded by our tax dollars (local, state, and federal)...it has no other viable or sustainable revenue stream. Let's cut the expenses paid for by taxes, then we don't need to collect so many taxes! Problem solved. We have the smallest state and local workforce per-capita in the entire United States. “House of Cards” tax code strategy can never work. Besides, using the Feds to reduce tax liability and then turning around and asking the Feds for more money for this or that program defies common sense. “Pass Through” taxes is exactly what business taxes are...passed through revenue from their customers who pay for goods and services. Business tax revenue is simply dollars passed through from their customers. Make business taxes zero and forget all the incentives and deductions. Just imagine what that would do for our economic development posture? Gov Whitmer, if your worried about taxes on SOME senior retirement accounts then you should worry about ALL of us equally...that’s only fair. Maybe a lower tax rate for retirement income? We should all pay something since retirement doesn’t end our use of general fund services. Don’t raise the regressive gas tax, lower the regressive sales tax but charge sales tax on services. (I thought Dems didn’t like regressive taxes?) I submitted a plan to Bridge on how this could work to fund roads, schools and zero out business taxes AND lower the sales tax rate to about 4%, but I haven’t had a reply. Thirty years ago Michigan and Minnesota were roughly comparable. During that time Michigan has been slowly reducing our taxes and Minnesota if anything has slightly raised theirs. We Michiganders pay about 8.5% state taxes. Minnesotans pay about 10.5%. This article from about 5 years ago shows how they have blown past us with great roads and schools and economic outlook. It appears there is a "sweet spot" (not too high, not too low)in tax burden and Minnesota seems a lot closer to it than we do. They were never concentrated in almost singularly manufacturing (and mainly automotive at that!) to our extent. They're WAY more diversified! We did things that chased businesses away and made them take a pass when looking to relocated - SBT and PP taxes along with others - heavy unionization workman's comp. 30 years ago we looked as we won, then the wheel turned! Not an even close comparison. Only 14% of Michigan economy is manufacturing, that is higher than many states, but still it's only 14%. Health care is bigger in Minnesota than GM is in Michigan. They are NOT WAY more diversified. Minnesota has the 10th most diversified economy and Michigan is in the middle of the pack at 24th. And Minnesota has a slightly higher percent of unionized employees than Michigan. Thirty years ago the powers that be decided to make Michigan a lower tax state and have succeeded. Minnesota has a much much bigger Ag / food sector Gargill, General Mills, Pillsbury which powered through 2000 through 2012+, as well as a huge transportation sector, on the edge of the Dakota Oil fields. A very different manufacturing sector 3M, Medronic for starters. The more I think about it there's no comparison to Michgan's Economy and MN's. They were and are incredibly fortunate And Mn is HALF our SIZE!. I believe you are comparing old numbers, and especially you're not considering MI's concentration on Automotive manufacturing. As for taxes, 30 years ago we had Blanchard, not a tax cutter, we've been 50/50 Democratic vs. Rs ever since Milliken. Michigan is in the middle of states as far as taxes, hardy low. A generation ago, when factories hummed and workers here made great wages, Michigan has the 13th highest burden in the nation. In 1977, Michigan’s state and local taxes were 9 percent higher than the national average. By 2014, Michigan’s tax burden was 19 percent below the national average. Ok so you've abandoned your MN vs. MI comparison? Good thing, NAM data I reviewed after your last comment doesn't support that contention at all. Now your point is because Michigan in 77 was a high tax (and not incidentally high cost of doing business state) bringing us back to that level of taxation would bring that prosperity back? I'd suggest that is correct as to the high tax , high cost economy of 70's and 80's and yes the 90s , but instead that is the exact reason Michigan was never able to diversify out of the old line manufacturing and automotive sectors and was left so vulnerable to these same businesses hitting the skids in 2000 - 2010. Your prescription of taking Mi back to that level would be a disaster. Show us an example of a poor state making its self a rich state by giving its citizens a huge tax increase. Every high tax state was rich first! Another view of Michigan's relative tax burden. What policy reason justifies enacting an income tax exemption for pension payments to retirees who were public employees, while taxing pension payments to retirees who were employees of private employers? None. Pensioners should receive the same tax treatment - either all taxed or all exempt. So instead of proposing new taxes to fund a new exemption just for public pensioners, why not simply decline to enact that exemption, thus alleviating that as a need for new taxes? Wow, appears to be a full court press on the gas tax and stealth funds shift to cover the Governors supporters; schools, public employees and generally low tax paying income earners. A great way to further facilitate the income inequality her side is always whining about. If strictly blue states like New York are finally recognizing antagonizing high income tax payers is a long term loser why do we want to go down that path? The issues should be unrelated. All Michiganders should pay taxes, including those getting pensions paid by the rest of us. AND the business tax-code should be competitive vis-à-vis the other 49 states. So Snyder fixed it. Just give him a nod and move on. Raise the gas tax (a user tax), and fix the darn roads. So gas taxes don't need to be in line with surrounding states? Whitmer doesn't have the guts to tell deadbeats where to go. Instead she seems to embrace them.